Phra Somdej chanted by Ajarn Toh is almost impossible to get nowadays even you got the money. Alternative Phims such as phims that have been chanted by his disciples or phims that have used his powder and ways to produce it is the best you can get from Wat Rakang. This batch of Phra Somdej Roy Pee have been created to commemorate 122 years of Wat Rakang and many top monks around Thailand have been in invited to at attend this ceremony. 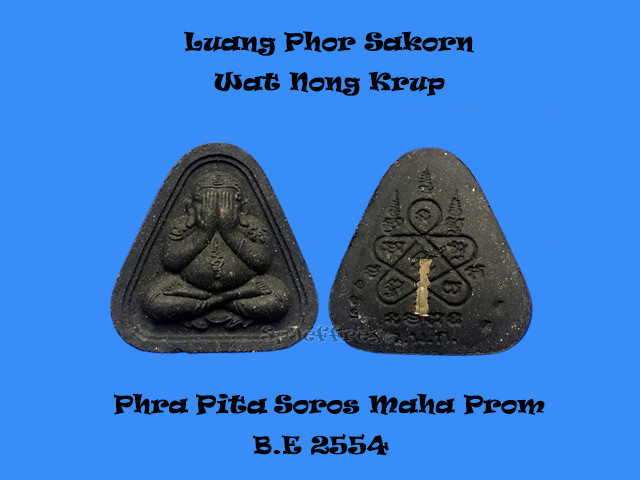 Phra Somdej is known to be an all rounder amulet which bestows wearer with effects such as Smooth sailing in life as problem is easier to solve, protection, business is getting better for businessman (wealth) and good Metta as getting along with people is never hard. Suitable for all ages and all walks of life. Lp Sin is one of the last few living disciple of Luang Pu Tim of Wat Lahanrai which is famous throughout the whole Thailand. Lp Sin is famous for his wealth and metta amulets which is highly sough as upon release, many have been grabbed empty. Phra Hanuman is known to be a great protector which bestow wearer protection from danger and black magic. As we all know that Phra Hanuman is a fierce warrior in war and is known to bring in great victory in everything you do, such as business and relationship and the power of authority to lead and command. Stuff with all time famous pong plaai kuman on the bottom of the amulet to further enhance the power of Phra Hanuman. Chanted by all disciple of Lp Tim, Lp Sakorn, Lp Sin, Lp Fu, Ajarn Chinaporn etc on the 100 day of Lp Tim passing. 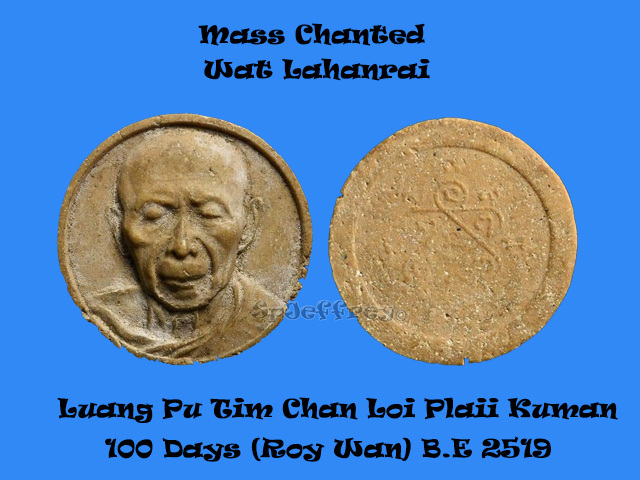 As Thai believes that on the 100 day of a person passing, the soul will come back to visit and for the making of this chan loi, Lp Tim is being invited back to bless this batch of amulets. Mixed with remaining old powder left by Lp Tim and his famous pong plaii kuman in makes this batch even highly sough than the chan loi produce for Wat bowin. Limited pieces made makes this very piece good for daily wearing and for collection. Last edited by spjeffrey; 14-11-2018 at 19:11. Luang Pu Tim chanted this batch of locket and release in Wat Mae Nam Khu which the prices of amulet release in other temple is still relatively affordable as compared to amulets released in Wat Lahanrai. 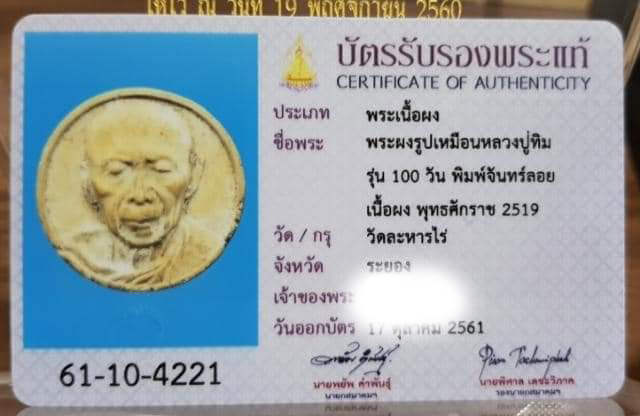 Not only Luang Pu Tim's famous Pong Plaii Kuman Khun Pean is famous but amulet chanted by him is as effective without the powder (personally experience). 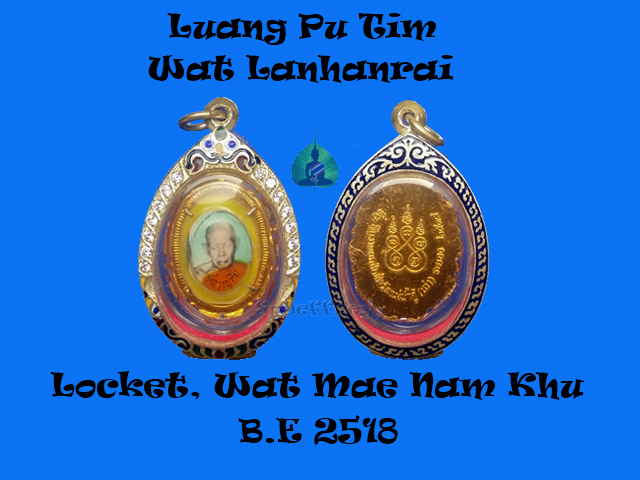 Amulets chanted by Luang Pu Tim is effective not only for metta but also wealth, protection and smooth sailing in life as long you pray with faith and work hard for it. Comes with a beautiful silver casing and ready to wear. Created for Lp Pae 89 birthday donation to the temple. Chanted by Lp personally and handed to devotee that donate to the temple. Amulets chanted by Lp Pae is known to help devotee overcome hard times and problem, metta and wealth. Not only that, multiple news reports showing believer wearing Lp Pae amulet coming out unhurt or little from freak accident. 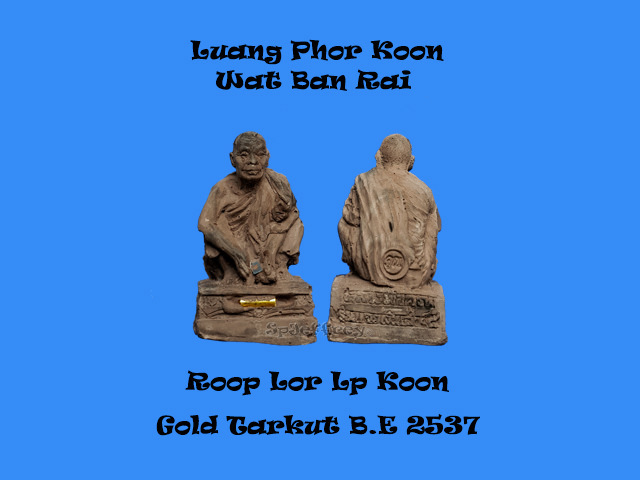 A rare piece not easily seen and a must have piece for Luang Phor Pae collectors. Chanted by Lp Koon personally and inserted with a gold tarkut in the front. Featuring Lp famous position with temple stamp at the back. Luang Phor's leg holds great power as told that he had walk through various jungle to other country while chanting. Hence you will always see images of Lp Koon stepping on money or using his leg to stamp on yant. A piece made from rare herb and powder great for protection and wealth. Chanted by disciple of Lp Tim, Lp Sin, Lp Fu, Ajarn Chinaporn and top monks of rayong to celebrate Wat Lahanrai anniverary. Coded with temple code, serial numbered and personally hand yant by abbot of the temple. 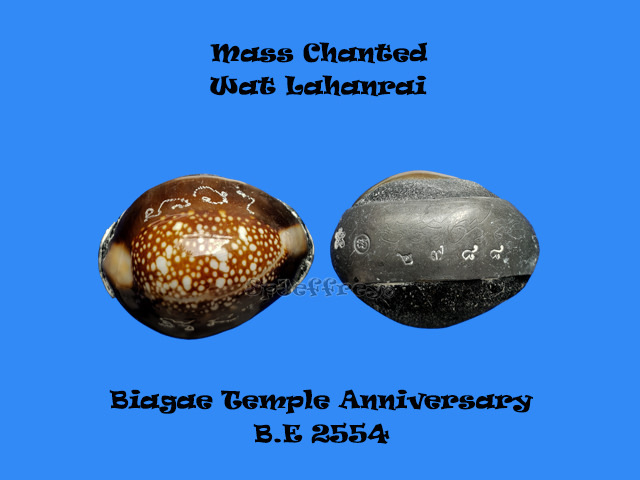 Biagae is great for protection from harm, black magic and other forms. Chanted by Lp Sakorn personally and added with precious pong plaai kuman left his his master Lp Tim. Using nur bailan and insert with 1 silver tarkut at the back of the amulet to further enhance the power of the amulet. Phra Pita is known to protect owner from harm, bring them weath and metta depending one the creator of the amulet. Luang Phor Ngern is known as a wealth Buddha be it in Thai or local. 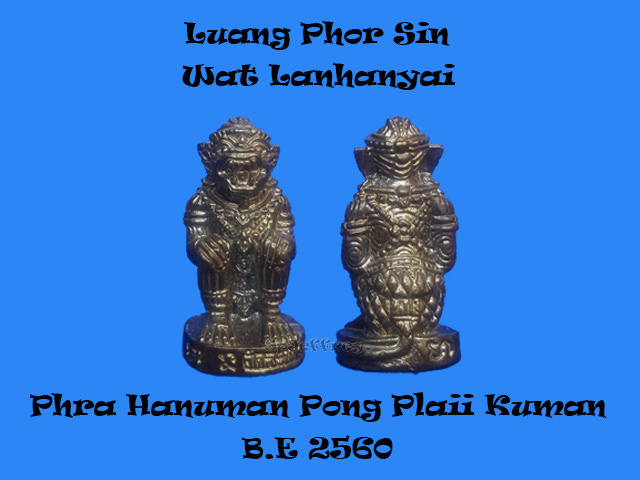 Businessman would love to have one of the bucha in their shop or wearing one as there is many feedback that whenever there is no business, a sincere prayer to Luang Phor Ngern and there will be businesses coming in. In Thai, Ngern is also known as money that’s why Luang Phor Ngern is also known as the wealth Buddha. But not everyone is able to place a bucha at their workplace, therefore wearing a Roop Lor is another option and you can bring it wherever you go, especially those that works in the sales line an requires running around the whole country without a proper work desk. 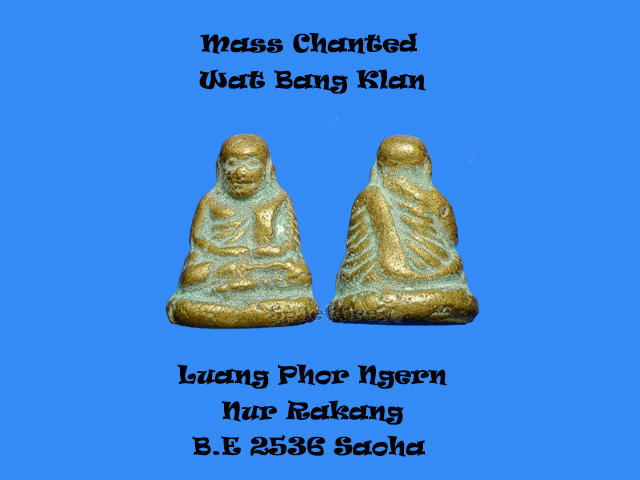 Mass chanted in Wat Bangklang using melted temple bell and chanted in saoha it is an excellent piece to wear it for wealth, fortune, luck and success in business that you do. 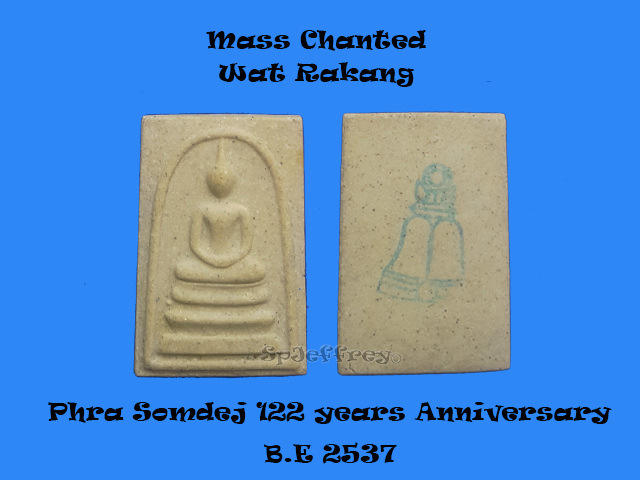 Amulets chanted in saoha is known to be more powerful and melted bell is known to be an very effective and rare material to make amulet.